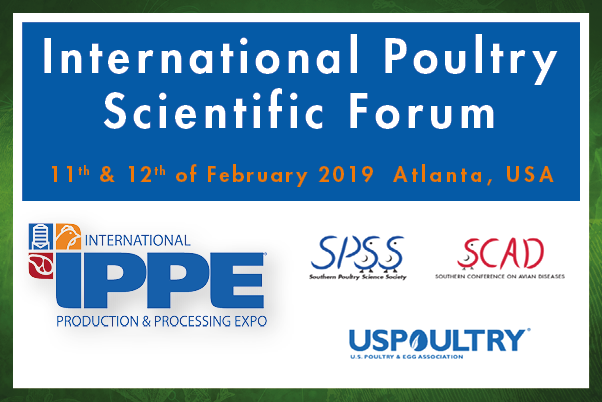 The International Poultry Scientific Forum will take place in Atlanta at Georgia World Congress Center, and start the day before IPPE opening. This forum presents information on industry topics such as environmental management, nutrition, physiology, pathology, processing and products, and avian diseases. Our Scientific Manager Animal Care, PhD Jean-François Gabarrou will present a poster & attend an oral presentation. 2/11/2019at 4:00 PM- 6:00 PMin B313 Foyer. 2/12/2019 at 9:45:00 AM in B314.